Made with a Boulder Beer Planet Porter, a beer whose flavors reminds one of a good quality strong coffee mixed with a bite of dark berry serves as a great platform for a robust bowl of stew. 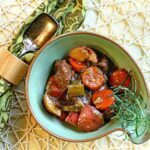 A long simmer in this flavorful broth, chunky vegetables, buffalo top round steak, all infused with lots of rosemary, results in a flat out wonderful savory rich flavor. 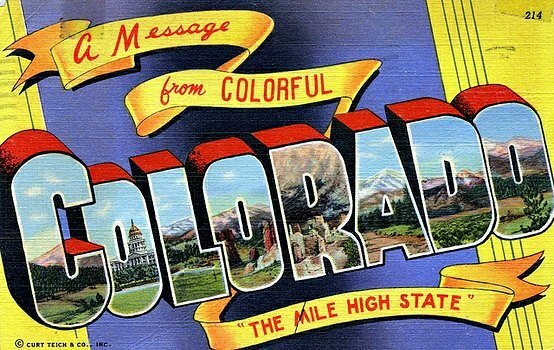 Located under the Flatirons in Boulder, Colorado, Boulder Beer Co. was Colorado’s first microbrewery. From humble beginnings in 1979, they’ve grown to produce almost nine million bottles of beer annually. With a tradition of innovation, they introduced this Planet Porter along with Colorado favorites such as Singletrack Copper Ale, Buffalo Gold and many more. But what makes a beer a “porter”? Porter is a dark style of beer originating in London in the 18th Century, A well hopped beer made from brown (or black in this case) malt. The name came about as a result of its popularity with street and river porters. The history and development of stout and porter are intertwined. The name “stout” for a dark beer is believed to have come about because a strong porter may be called “Extra Porter” or “Double Porter” or “Stout Porter”. The term “Stout Porter” would later be shortened to just “Stout”. For example, Guinness Extra Stout was originally called “Extra Superior Porter” and was only given the name Extra Stout in 1840. Thank you Wikipedia. Goodbye to my normal method of making beef stew and hello to this Boulder Beer recipe. Usually I cube everything, toss it in the crock pot with seasonings, beef broth and a can of tomatoes and let it simmer all day. 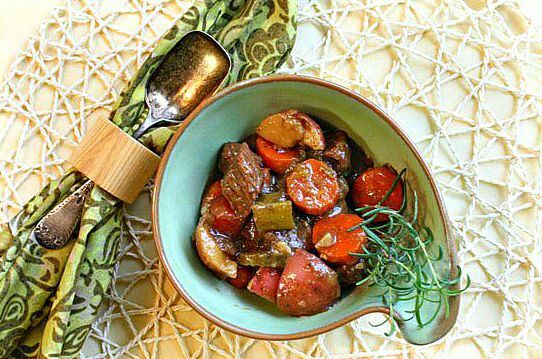 This recipe brings beef stew to a new rich and savory level. And with high’s in the 40’s and an all day drizzle, this really hit the spot. Let’s take a look. In a large cast iron skillet, heat 3 T. vegetable oil. Add onions and cook until translucent. About 3 minutes. Add garlic, salt and rosemary and cook, stirring frequently for 5 minutes. Remove from skillet and into heavy soup pot. Toss cubed buffalo with enough vegetable oil to coat. Reheat the cast iron skillet and brown meat well on all sides. Work in batches as to not over crowd. Remove meat from skillet and deglaze with one bottle of the Boulder Beer Planet Porter. Place everything in a heavy soup pot and let simmer on low for one hour. Add chopped vegetables and simmer on low for one more hour. Soften butter and mix in corn meal and flour to make a paste. Add to stew and simmer for 30 more minutes. Note, original recipe called for 32 ounces of beer. I’m sending this to paradise to participate in Souper Sunday event hosted by Deb over at Kahakai Kitchen. Boulder Beer Porter Stew…It’s What’s for Dinner. Looks good, but mostly, since I couldn’t taste it, Great photo! I have so much to learn when it comes to beers and micro brews. 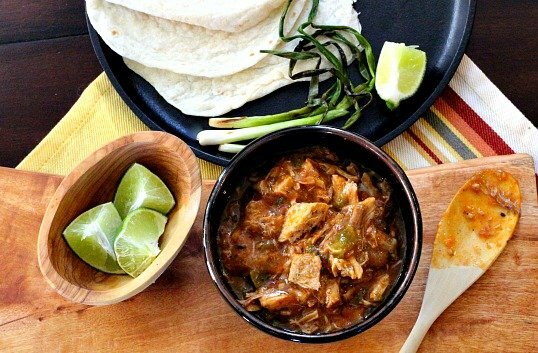 But I do know beer brings incredible flavor to stews. This reminds me of a French dish, Beef Carbonade. Yep, even the French use beer in their stews. This sounds perfect for your crisp weather Lea Ann. We came back home for summer and found fall like temperatures here as well. Sam, I know nothing about microbrews, but agree about the interesting flavors to food. I just made beef carbonade and lOVED it. The recipe I had did not use beer. Darnit. As always Sam, thanks for stopping by and the comment. First of all, thanks for the beer lesson – I have a few beer enthusiasts in my life, and I would love to learn more about that. This stew sounds like it would have a crazy good flavor. I always love the flavor that wine or beer adds to a dish. It’s that taste that makes me go mmmm when I take that first bite and then stop to try and figure out what I’m tasting. Also, the cornmeal in the roux has really got me interested in trying this. I am not a beer enthusiast, but do find it interesting what it does to the flavor of food. Plus the recipe called for 32 ounces of beer … yikes, lots of flavor and I thought it would be incredibly thin. I cut it back to one bottle. That stew was crazy good and as you can imagine it got better with each left over serving. The cornmeal was an improv. It called for corn flour. I wasn’t going to make a special trip to find that, so used corn meal. Seemed to work fine. I really really really don’t like beer, but put it in a savory stewed beef dish and I’m a fan. This looks flavourful and mouthwatering! Love your serving bowl. Thanks Angie! That serving bowl is pottery called Frankoma. The stew looks delicious and I like the look of the larger pieces. I can imagine the improvement of adding the porter to it. Beer, like bacon just makes food taste better! Love the photo, I’m really digging your spoon and bowl. I like your beer/bacon comparison. I agree! That spoon is something I brought home from my in-laws when we cleaned out their house. The bowl is Frankoma pottery. Porter and beef go really well, I love it! Great photos Lea Ann! Marina, I’m just finding that out. I’ve never cooked with porter. So savory. Your site looks great! I’m loving the header…I have a real fondness for tree images. The stew also looks great. Since having a baby, I make a lot of soups and stews (because they freeze so well). The Boulder beer is a great ingredient. Does Elway drink it? I am wondering about the buffalo. I have not had buffalo sirloin but I know it is very lean. Was it tender? Raider Fans want to know. It was very tender. And yes, I was worried about that. This piece of meat was one big chunk of red. Not a single marble in sight. I had no idea what a long simmer would do to the meat. The recipe called for a 30 minute simmer. My psyche just couldn’t put the words “stew” and “30 minutes” together, so I cooked it like I would normally cook a stew. I don’t know if it was the beer or the buffalo, but that meat sure seemed to gather the flavors better than beef. Oh, I love a good stew – this looks wonderful. I like to use beer in things like this, too. This is one of those “good stews”. Thanks Karen. First, can’t believe it is that ridiculously cold there! Yikes. I really like this recipe. I can imagine the porter bringing a great base flavor to the stew. The way you describe the beer reminds me of Yazoo Sue, made from cherry wood smoked hops. I will try this as soon as I get my hands on some more of it. This does look really rich and savory and I want to try that beer too. 😉 Thanks for sharing it with Souper Sundays this week. It’s always nice to have you join in. Thanks Deb. Always glad to join in. Oh this looks amazing, rich and hearty. thanks for sharing and giving us some info on porter beer. It was a learning experience for me too Vianney. This stew was really good.